First of all, I don’t remember being particularly morbid. I am not a goth nor any other species of darkness-dweller, clad in black, dour, wan, and surly. 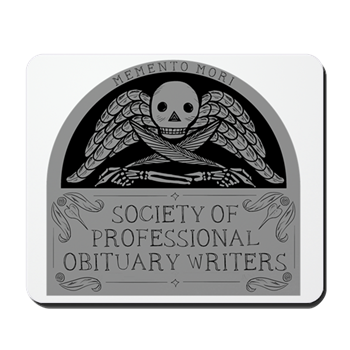 So how is it that I am now an obituary hound, as well as a horror-film historian? Do we see a trend here? I finally put it all down as a lifelong attempt to master my heart-stopping fear of decay and dissolution — but it hasn’t made me adept at funerals. My little sideline in all things deathly, from end-of-life issues to death itself, to the grief, the burials, the memorials, does not extend to being a connoisseur of final rites. I am horrible at funerals, as planner, executor, participant, and guest. My presence provokes disaster. For instance, the case of the passed-out pallbearer. No one anticipates this, though I would assume that the bigger funeral firms have stage managers, security, designated backup handle-grabbers and all that. But what do the amateurs do? Funerals are for the living, not the indifferent dead, and the theater geek in me wants the show to go off well. Keep up the pace, no embarrassing longeurs, please! Now, a pallbearer passing out is technically not a problem. A coffin has six handles, you lose one guy (I must say the patriarchy still holds sway here — I can’t remember ever seeing a female pallbearer), you are still at 85 percent. However, pallbearers are primarily chosen on the basis of their relationship to the deceased, not on their ability to heft their dead weight. Sometimes one falters. Nothing puts a damper on a funeral faster than an unconscious person blocking the main exit. Little is less enchanting than holding the dead up with one hand and helping the fallen up with the other. Casket-lowering devices, too, are a source of diversion during the solemnities. These can jam during descent, leaving the deceased suspended precariously between heaven and earth, forcing some the funeral attendants to strip off their suitcoats and wrassle with the mechanism while the bereaved are shepherded away from the excavation site. You see, there are two enormously conflicting impulses at work in my family history. One of them is conservative and respectful. We are rule-followers, observant of hierarchies, submissive to authority, confident in the system. We are the descendants of “holy Danes,” God-fearing, tight-lipped, Scandinavian immigrant farmers and preachers, all hopped up on a kind of dogmatic, fundamentalist Lutheranism (an oxymoron personified). This is a theology founded on the rock-solid and reigning principle that we are not here to have fun. Instead, we are trapped in some kind of hellish foyer, nervously on our best behavior, waiting our turn for judgment. We are here to suffer and be tested. We will pass into Glory if and when it is determined that we lived a good enough life to merit union with the Blessed Elect. (My great-uncle’s second wife locked him in the basement on Sundays so he couldn’t watch Hopalong Cassidy reruns. T’was a violation of the Sabbath, t’was.) This status is conferred by a consensus of the survivors, and is subject to revision as the evidence accumulates. On the other hand, our tribe is a bunch of goddamned crazy anarchists, reprobates, wisenheimers, failures brave and cowardly, addicts, obsessives, mockers, freethinkers, corrosives, despiters, drunks, and adulterers, mad and lonely, lost and angry in a world not of our own making and not to our own liking. The pathologies squeezed out from under the compression of conformity. A relentless, questioning strain of intelligence infuses our heritage with skepticism. We learned to laugh to keep from cracking until the solemn strain. These impulses collided. My father had an older brother who died quite young, and in my grandparents’ house, in the living room, was enframed an arrangement of photos of Alan, alive around the edges and, in the center, posed dead in his coffin. This last was not an uncommon practice at the time, and was not perceived as strange. And his musket molds in his hands. . . .
Are you kidding me? Imagine that being one of your first memories. No wonder I have problems. My first big funeral was my grandfather’s, when I was seven. He died two days before Christmas, so we left the presents under the tree and drove back to Nebraska to bury him. No one told me the open-casket rule was in effect. Now, the funeral home had “visitation rooms,” in which they’d traditionally set up the coffin, folded open to display the deceased if aesthetically possible. There were “visiting hours.” There were two rows of folding chairs, split by a central aisle. I was urged to go and look at Grandpa. I got close enough to see his features. He was mottled, waxy, disturbingly lifelike. I was told it was OK, it wasn’t really him. The padded coffin lining, the pillow beneath his head, all spoke of sleep. But this wasn’t sleep. I backed out, away from the thing that was him and not him. I had already had enough. As a whole generational wave of ancestors passed away, frequently came the call to slip on the Sunday shoes, suit, and tie. We sat in pews listening to lugubrious sermons. We heard homilies. We sang hymns we could barely remember the words to, mouthing silent approximations. We ate potluck Jello dishes in church social halls afterwards. (It seems you cannot legally hold a funeral in the Midwest unless Jello is provided.) We looked at the faces of the departed, “improved” and altered by the ministers of the so-called “restorative arts.” Many of them went underground in a state of unrecognizable prettification. There are other flashes of remembered panic. Writing my parents’ obituaries. That time I couldn’t deliver a eulogy because I was crying too hard. The time the minister tried to comfort us after the service with hand puppets. That time during my dad’s funeral when whatever holy Joe the chapel rounded up to preside stopped everything to drum up business. “And if anyone here finds themselves in a similar situation, I urge you to please consider this establishment to meet your needs.” A commerical. True, there things work out. Dad it made to his gravesite without mishap, where he currently lies on top of his second wife. (With a narrow plot, side-by-side placement was not in the cards.) My mother, who experienced most of these mishaps with us, chose cremation. However, even this attempt to slip away gracefully failed miserably. The container with her ashes sat around for a few months, during which it was lost, refound, sat on, and opened by mistake. It is not quite as depressing to view a loved one turned into “cremains” as it is to see them as a corpse . . . but neither is it a fiesta. I can’t describe what it feels like to accidentally stick your hand into a bag of your mother. In the end, according to her wishes, her ashes were dispersed near the farm where she was raised. I heard the ceremony was nice. I opted to go on a long-scheduled trip instead. I am still happy with that decision. As much as I dislike the mechanisms of burial, I would prefer to live the rest of my life without wondering whether some of the dust that’s blowing into my eyes is Mom. At least I’ve figured out my personal funeral formula. 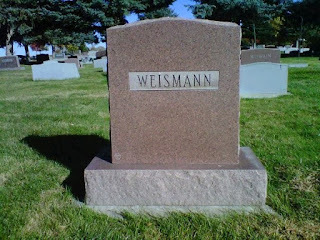 Having converted to Judaism years ago, I am assured that I won’t be cremated or embalmed. I will be stuck into a plain wooden box, and my people will shovel the dirt in over me. I like that idea. After a year, I get a gravestone (the deceased’s memory is deemed to be fresh enough not to warrant one for some time after death). Mourning is strictly prescribed in Judaism, with a set of rules that gives grief the proper space without letting it overwhelm everyday life. It’s scripted, in easy-to-remember units of one week, one month, one year. In this case, the ritual is based on an understanding of how the human soul operates, and it channels the feelings. Excessive visits to the graveyard are discouraged in Judaism; life must go on. Whereas in childhood, our visits to the graveyard were almost weekly, bordering on ancestor worship. Eating at the grave site, not so different from the Asian and Hispanic grave-tenders we found in our National Geographics. We would stand among the labeled stones while various late individuals were pointed out and praised, or anathemized. As the grown-ups became distracted, we would break away and start playing. Soon we were slipping off our uncomfortable Sunday shoes, running in the sunshine, leaping over the headstones. Defying the gravity. Such a well-written piece! Funny and sad and makes one think. We're a "cremate and scatter" family, which means I am not 100% sure my sister and I scattered our father's ashes, it may have been the Kitty Litter my mother kept in the trunk of her car.